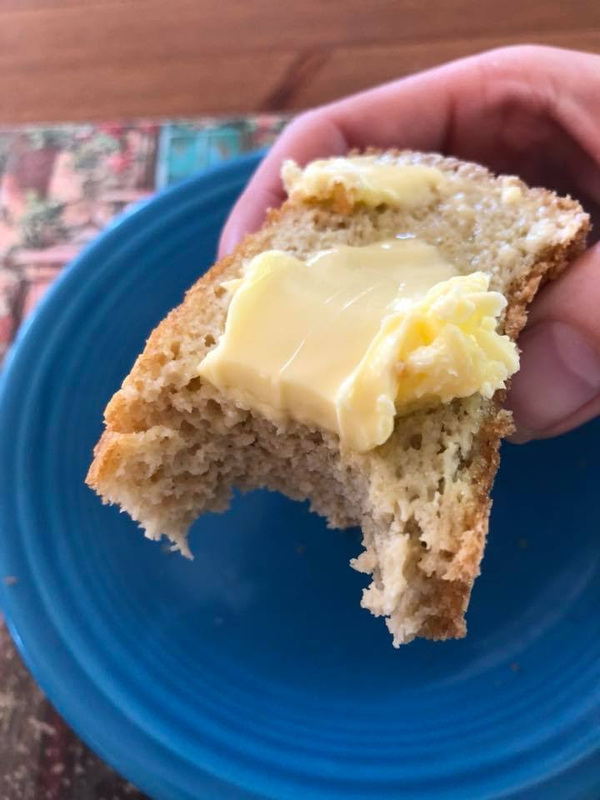 I get questions every day from people whose health improved when they cut out eating bread~but they miss the taste and that emotional connection~and are looking for delicious bread that is gut friendly. Today I’ll be sharing a recipe with you that tastes AMAZING and so much easier for your body to digest! I’m excited to share this with you because my passion is to work with people whose health symptoms–like gut/digestive issues, excess weight, low energy, and sleep problems–are getting in the way of them living life fully and with a sense of freedom in their bodies. I help them to regain their health so they can feel great and free to enjoy their lives again. One of the ways I’m able to help people like you is by giving you great recipes that are a lot more nutrient-dense and cut out common inflammatory ingredients. 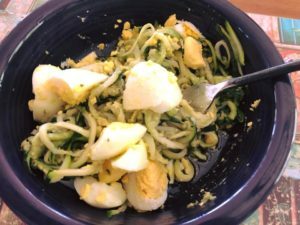 I learned about this recipe from the Netflix documentary The Magic Pill. You are going to love how easy and tasty this bread is! Blend macadamia nuts to make butter. Add coconut butter and other ingredients except lemon juice and blend well (add lemon juice at the end). Grease a bread pan and add batter. Bake at 350 for 35 mins. Allow to cool before serving. Enjoy!!! And remember, your body was designed to be healthy! You can use recipes like this one to take charge of your health so you can enjoy your life more fully. 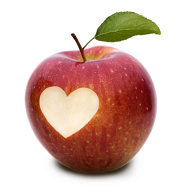 You can set up a complimentary Unstoppable Health Discovery Session with me here. I just opened up 2 more slots for June so if you’d like to connect with me, grab your spot here. Last week I told you all about bitters and how you can easily add them into your day to powerfully support your gut health. In case you missed it, you can find out about it here. Every day, I work with people whose health symptoms–like gut/digestive issues, excess weight, low energy, and sleep problems–are getting in the way of them living life fully and with a sense of freedom in their bodies. I help them to regain their health so they can feel great and free to enjoy their lives again. I’ve got an easy, delicious recipe for you today loaded with good stuff for your gut! To quickly recap, why I focus on gut health so much is because that’s the common culprit to virtually every symptom! You can’t be healthy and free of symptoms if your gut isn’t functioning properly. Your gut is where the magic happens: where you take all the good stuff you eat and drink and transform it into the building blocks your body needs to make energy, sleep well, maintain a healthy weight, build muscle, and clear out toxins that need clearing out daily so you can thrive. 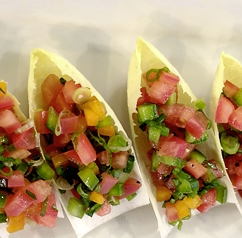 The ingredients in this recipe are full of nutrients to support a healthy gut! Zucchini is loaded with antioxidants, B vitamins, potassium, and Vit C. 1 medium zucchini yields half of your daily Vit C needs! Zucchini are also known for hydrating the body and soothing the gut (partially due to its high water and fiber content). 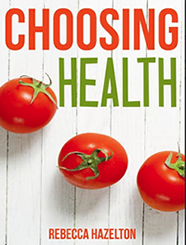 Research suggests that this veggie has anti-inflammatory properties as well. Key ingredients in pesto like basil and garlic are powerful immune boosters AND anti-microbial so they help your good gut flora to thrive while fighting off unfriendly flora and viruses. 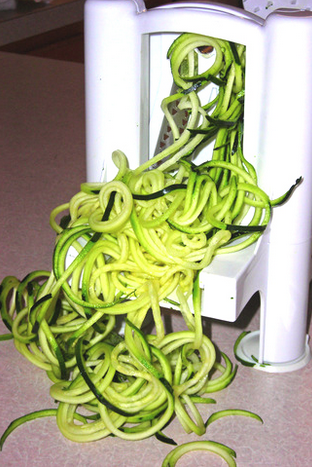 Let’s start with the zucchini noodles (also called zoodles or zucchetti). These are made with a spiral slicer and are a fun, fork twirl-able staple food for anyone looking to add a nutrient-dense, gluten-free/grain-free noodle into their meals. You will need a handheld or free standing spiral slicer to create long, thin strings. If you are cooking for several people or love to batch cook, the free standing one shown in the picture will save you time and energy. Otherwise, a handheld one is the way to go. Slice ends of zucchini off and slice zuch in half. 1 medium zucchini per person. Cook on low-medium heat in olive oil for 10 minutes. 1 zuch per person. OR bake in the oven on a tray lined with paper towels (to soak up moisture) at 250 for 20 mins (this yields a firmer zoodle, which I love). Top this with pesto, or fresh tomatoes, a homemade tomato sauce, and/or protein of choice) and stir well. I love Pasta Mike’s organic pesto sauce (made with olive oil, not canola or soy)~look for a brand that uses quality oil! Favorite toppings are hardboiled eggs (shown below), sausage, grilled chicken, or shrimp. 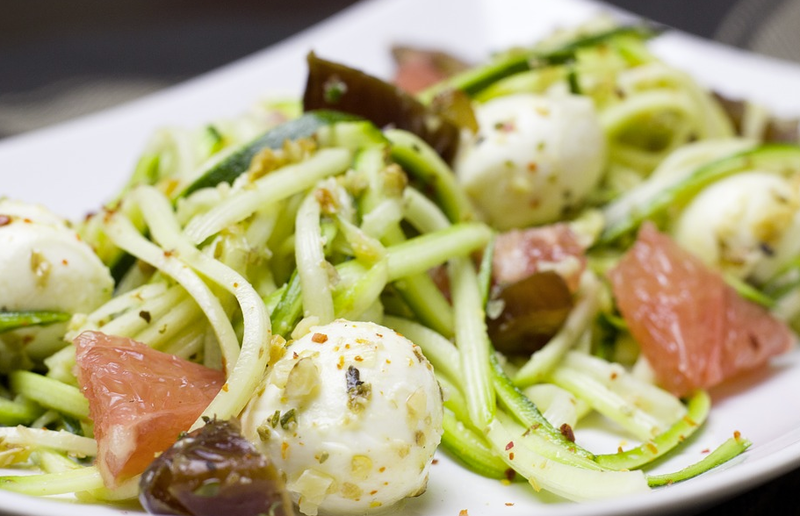 Enjoy this delicious and happy gut zoodle pesto! Get a handheld or free standing spiral slicer. If you have a family or love to batch cook, the free standing one shown in the picture will save you time and energy. Otherwise, a handheld one is the way to go. Favorite toppings are hardboiled eggs, sausage, grilled chicken, or shrimp. Last week I let you in on a secret gut healing ingredient. In case you missed it, you can find out about it here. I’ve got an awesome topic to share with you today that can help you experience better gut health. To quickly recap, why I focus on gut health so much is because that’s the common culprit to virtually every symptom! Your gut is where the magic happens: where you take all the good stuff you eat and drink and transform it into the building blocks your body needs to make energy, sleep well, maintain a healthy weight, build muscle, and clear out toxins that need clearing out daily so you can thrive. You can’t be healthy and free of symptoms if your gut isn’t functioning properly. Today, I want to talk to you about how bitter foods support your gut health and some super easy ways to add them into your day. Why are bitter foods awesome for my gut? Bitter foods have been used for many years to stimulate digestive juices (the stuff your body makes to break down the food you eat so you can use it for everything in your life: work, play, being generally wonderful). Bitter foods increase your 3 digestive powerhouses: stomach acid, enzymes, and bile. Without these guys, there won’t be any magic happening. You won’t be able to break apart your food so you’re going to experience symptoms like fatigue, brain fog, anxiety, bloating, gas, and/or bathroom trouble to name a few. Some tips to add bitters into your day are to enjoy a bitterbeverage like dandelion or chicory tea (2 of my favorites are Teeccino Dandelion Caramel Nut and Traditional Medicinals Roasted Dandelion), toss a handful of bittergreens like arugula into your salad, soup, or stew, use apple cider vinegar in your dressing, or use endive leaves like a chip or cracker and dip in guacamole, salsa, or favorite healthy dressing (see picture below). If eating or drinking bitter things is totally new for you, have patience with yourself when adding them in. Pick one of the suggestions I’ve shared with you to enjoy this week and build from there. Little by little, a little becomes a lot. You’ll be on your way to a better functioning belly!